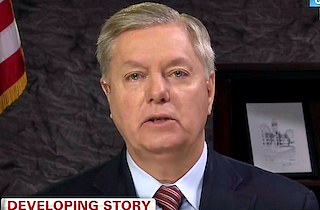 Sen. Lindsey Graham (R-SC) is very upset about government surveillance. Yes, that Lindsey Graham. Wait, what? Here’s the catch, because you knew there had to be one: He’s only upset about government surveillance techniques when they are allegedly utilized on his own staffers. Graham’s comments come in addition to his Senate colleagues John McCain (R-AZ) and Dianne Feinstein (D-CA), both ardent defenders of current surveillance operations who somehow find it appalling the government would dare spy on them. So… protection against overzealous surveillance operations? “Good enough for me, but not for thee,” these senators seem to suggest.